Twister’s adored father has disappeared leaving her with a depressed mother and Aunt Honey who provides delicious home-cooked meals but doesn’t have much time left over for her niece as she is busy running the farm. At school Twister doesn’t fare much better as the other children find her ways odd and ignore her. Their strict teacher Miss Ida does not understand how bright Twister is either. But it is the relentless bullying brutally meted out by Clem that wears her down the most although it is clear that Clem has been abused by his own father who is in prison. The only comfort Twister finds is in her dog Point. One day fleeing for her life from Clem and his gang who have threatened to cut out her tongue Twister runs into the reclusive Turrety Knocks whose wife and daughter have recently died in a fire. 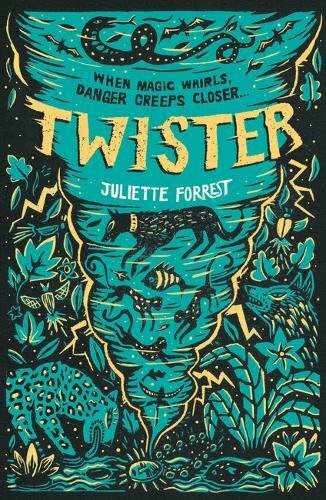 He gives her a letter from her father which sets Twister off on a perilous journey to find him and make her mother smile again. At this point the story becomes increasingly more fantastical involving a powerful witch Maymay, an ancient and dangerous magical necklace which gives the wearer the power to shape-shift, a ghost child and an evil villain, White Eye. this original and striking novel.